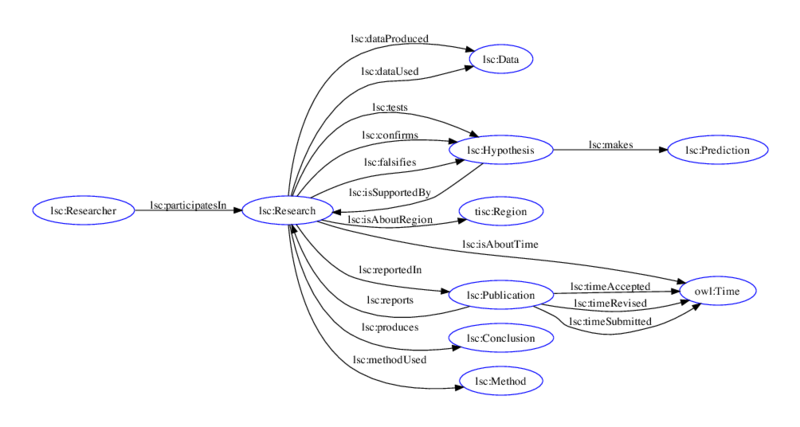 How should a science schema look like? The Linked Science Core vocabulary is designed for describing a research setting and to interconnect it to other related things and components (researcher, data, hypothesis, etc.). You may check LSC online at http://linkedscience.org/lsc/ns/. There will be a breakout session at the Science Online London 2011 (#solo11) to develop a schema or a vocabulary for science, and we will use LSC as a basis for stimulating the imagination for doing so. We hope to use the results of the Science Online London to extend and improve LSC. Stay tuned and follow our twitter feed @LinkedScience—-or participate our breakout session at Science Online London to develop new ideas for describing and publishing scientific content online! Scientific efforts are traditionally published only as articles, with an estimate of millions of publications worldwide per year; the growth rate of PubMed alone is now 1 paper per minute. The validation of scientific results requires reproducible methods, which can only be achieved if the same data, processes, and algorithms as those used in the original experiments were available. However, the problem is that although publications, methods and datasets are very related, they are not always openly accessible and interlinked. Even where data is discoverable, accessible and assessable, significant challenges remain in the reuse of the data, in particular facilitating the necessary correlation, integration and synthesis of data across levels of theory, techniques and disciplines. In the LISC 2011 (1st International Workshop on Linked Science) we will discuss and present results of new ways of publishing, sharing, linking, and analyzing such scientific resources motivated by driving scientific requirements, as well as reasoning over the data to discover interesting new links and scientific insights. Making entities identifiable and referenceable using URIs augmented by semantic, scientifically relevant annotations greatly facilitates access and retrieval for data which used to be hardly accessible. This Linked Science approach, i.e., publishing, sharing and interlinking scientific resources and data, is of particular importance for scientific research, where sharing is crucial for facilitating reproducibility and collaboration within and across disciplines. This integrated process, however, has not been established yet. Bibliographic contents are still regarded as the main scientific product, and associated data, models and software are either not published at all, or published in separate places, often with no reference to the respective paper. In the workshop we will discuss whether and how new emerging technologies (Linked Data, and semantic technologies more generally) can realize the vision of Linked Science. We see that this depends on their enabling capability throughout the research process, leading up to extended publications and data sharing environments. Our workshop aims to address challenges related to enabling the easy creation of data bundles—data, processes, tools, provenance and annotation—supporting both publication and reuse of the data. Secondly, we look for tools and methods for the easy correlation, integration and synthesis of shared data. This problem is often found in many disciplines (including astronomy, biology, geosciences, cultural heritage, earth, climate, environmental and ecological sciences and impacts etc. ), as they need to span techniques, levels of theory, scales, and disciplines. With the advent of Linked Science, it is timely and crucial to address these identified research challenges through both practical and formal approaches. – Research papers. These should not exceed 15 pages in length. – Position papers. Novel ideas, experiments, and application visions from multiple disciplines and viewpoints are a key ingredient of the workshop. We therefore strongly encourage the submission of position papers. Position papers should not exceed 5 pages in length. Science guidelines for proceedings available at http://www.springer.com/computer/lncs?SGWID=0-164-7-72376-0. Papers should be submitted in PDF format. All submissions will be done electronically via the LISC2011 web submission system. At least one author of each accepted paper must register for the workshop. Information about registration will appear soon on the ISCW2011 Web pages. – Case studies on linked science, i.e., astronomy, biology, environmental and socio-economic impacts of global warming, statistics, environmental monitoring, cultural heritage, etc.